The Hostel offers fun, affordable, clean, and secure accommodations so that you get the best value during your stay with us. We have our own restaurant and bar (Biergarten), which offers you a variety of salads, sea food, vegetarian and typical Brazilian food. Enjoy the night at the Biergarten Bar with typical Brazilian cocktails and the best Latin music available.Credit Cards Payments will be charged a 5% extra fee. From the Airport - You need to catch the bus to the Main bus station in Rio de Janeiro (Rodoviaria Novo Rio). From there you take the bus to Angra dos Reis, which runs every hour on the hour. The journey costs around R$ 35,00 and takes around 2 and a half hours. In Angra dos Reis, you have to go to the pier (Cais da Lapa) and take the boat to Abraao-Ilha Grande. The first boat leaves at 13:30, 14:30, 15:30 (the main ferry and the cheapest on weekdays, costs around R$7,00) and 16:00. 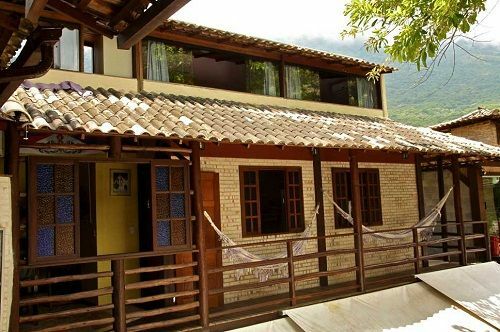 Once in Abraao- Ilha grande, you take the church street and we are located after the first bridge. Have a nice journey.